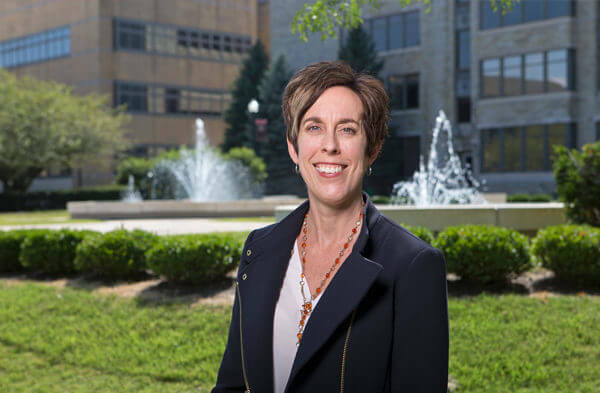 Linda Saborío, NIU Professor of Foreign Languages and Literatures, began her term as Executive Secretary of University Council and President of Faculty Senate this summer. During the spring semester, Faculty Senate officially nominated – and University Council officially elected – Saborío to the position. Her term officially began July 1, though she has worked hard since her election to begin her transition into the role. The University Council has the power to establish educational and academic policies of the university and provide input on related matters, including advising the president and the vice presidents on policies affecting the quality of student life on campus. The Faculty Senate serves as the official voice of the NIU faculty and as the representative liaison body between the faculty and the University Council, the president of the university, the executive vice president and provost, other vice presidents with respect to their responsibilities affecting the faculty, and the Board of Trustees. Saborío said she will advocate to ensure faculty representation and participation in shared governance procedures and policy development. Saborío replaces Greg Long, Professor of Allied Health and Communication Disorders, who recently retired from the university. The position is a one-year elected term, and Long served two consecutive terms. Saborío earned her M.A. and Ph.D. in Spanish from the University of North Carolina at Chapel Hill. She earned her B.A. from University of California at Irvine in Comparative Literature and Spanish. Her research interests include Latina/o and Mexican theater, culture studies, performance studies, and borderlands literature and art.